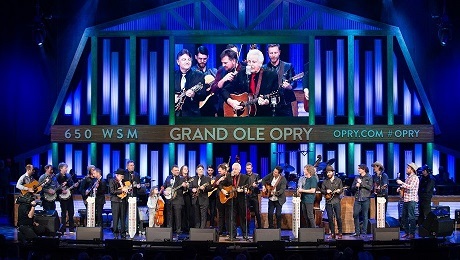 Del McCoury, Bluegrass Legend from Nashville, celebrated his 80th Birthday recently in 2019 at the The Grand Ole Opry in Nashville, Tenn.
Del has been performing for 5 decades and continues with his sons band, The Travelin' NcCourys, which is made up of his 2 sons, Rob on banjo, Ronnie on Mandolin as well as Jason Carter on fiddle, Alan Bartram on bass and in addition, Coby Kilby who fills in for Del on guitar. In the past, Del won 2 Grammys and a 9 time IBMA Entertainer of the Year. Also Del's original band won Instrumental group twice and won song of the Year in 2002 and 2004. Ronnie McCury won mandolin player of the year 8 times, Jason Carter won fiddler player of the year 5 times and Rob McCury won a banjo award once and Alan Bartram won a bass award once. The Band, The Travelin' McCurys won a 2018 Grammy for Best Bluegrass Album of The Year.